Welcome to DiscountParrotSupplies.com! 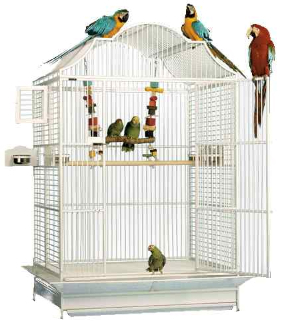 This is your starting spot for finding a great deal on bird cages for sale. Use the navigation links to the left to narrow down your options and find the right cage for your parrot. Along with a good diet, the right bird cage is one of the most important factors in ensuring your bird's health and longevity. Unfortunately, cages are too often an afterthought for some new parrot owners and the primary concern is with getting something cheap rather than finding the most appropriate cage for their new bird. Luckily, there are great online deals to be had on new or used bird cages, and you can often find a much better quality cage for the same price as what you'd pay at your local pet store, if you only know what to look for. Cage Size - All things being equal, the larger your bird's cage, the happier it will be. Since people's ideas of "large enough" are entirely subjective, we created a handy chart listing cage size requirements for different types of birds. Please note the recommended bar spacing as well, since inappropriate bar spacing can be unsafe for your bird. Hint: The bird cages they try to sell you at your local chain pet store are usually woefully inadequate for your parrot. Cage Shape - There are many different types of cage styles, including dometop, playtop, corner cages, etc. For the most part, the type of cage you choose will depend on your own preference, but there are certain cages that are just inappropriate as anything except decoration. Avoid round cages, and cages that are tall but too skinny. Cage Material - Stainless steel cages are the highest quality material you can buy, but these can be quite pricey. On the opposite end of the spectrum are cheap little cages with flimsy bars that are coated in plastic that a bird can easily chew off. The most popular compromise is a powder-coated cage. Cages made of decorative materials are also not appropriate for housing birds. Cage Setups - Even the biggest, highest-quality cage isn't a "home" for your bird without plenty of toys and enrichment opportunity. Because parrots are such highly intelligent creatures, evolved to spend much of their day flying and looking for food and interacting with their flocks, they don't do well simply sitting on a perch with nothing to do all day. It's important to their mental and physical health to offer them lots of intellectual stimulation, including a variety of bird-safe toys. A good bird cage is an investment that will probably stay with you as long as you have your bird, so invest in the best cage for your bird now to avoid unnecessary replacements. Finding the right cage for your parrot will require some research and comparison shopping, so browse the site and look at your options until you feel comfortable with your choice. The cage you pick will be your parrot's home for many years to come.